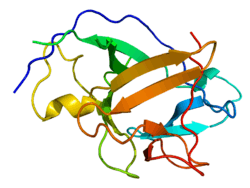 Interleukin 1 alpha (IL-1α) also known as hematopoietin 1 is a protein of the interleukin 1 family that in humans is encoded by the IL1A gene. In general, Interleukin 1 is responsible for the production of inflammation, as well as the promotion of fever and sepsis. IL-1α inhibitors are being developed to interrupt those processes and treat diseases. IL-1α is produced mainly by activated macrophages, as well as neutrophils, epithelial cells, and endothelial cells. It possesses metabolic, physiological, haematopoietic activities, and plays one of the central roles in the regulation of the immune responses. It binds to the interleukin-1 receptor. It is on the pathway that activates tumor necrosis factor-alpha. IL-1α is a cytokine of the interleukin-1 family. Interleukin 1 was discovered by Gery in 1972. He named it lymphocyte-activating factor (LAF) because it was a lymphocyte mitogen. It was not until 1985 that interleukin 1 was discovered to consist of two distinct proteins, now called interleukin-1 alpha and interleukin-1 beta. IL-1α is also known as fibroblast-activating factor (FAF), lymphocyte-activating factor (LAF), B-cell-activating factor (BAF), leukocyte endogenous mediator (LEM), epidermal cell-derived thymocyte-activating factor (ETAF), serum amyloid A inducer or hepatocyte-stimulating factor (HSP), catabolin, hemopoetin-1 (H-1), endogenous pyrogen (EP), and proteolysis-inducing factor (PIF). IL-1α is a unique member in the cytokine family in the sense that the structure of its initially synthesized precursor does not contain a signal peptide fragment (same is known for IL-1β and IL-18). After processing by the removal of N-terminal amino acids by specific proteases, the resulting peptide is called "mature" form. Calpain, a calcium-activated cysteine protease, associated with the plasma membrane, is primarily responsible for the cleavage of the IL-1α precursor into a mature molecule. Both the 31kDa precursor form of IL-1α and its 18kDa mature form are biologically active. The 31 kDa IL-1α precursor is synthesized in association with cytoskeletal structures (microtubules), unlike most secreted proteins, which are translated on ribosomes associated with rough endoplasmic reticulum. The three-dimensional structure of the IL-1α contains an open-ended barrel composed entirely of beta-pleated strands. Crystal structure analysis of the mature form of IL-1α shows that it has two sites of binding to IL-1 receptor. There is a primary binding site located at the open top of its barrel, which is similar but not identical to that of IL-1β. IL-1α is constitutively produced by epithelial cells. It is found in substantial amounts in normal human epidermis and is distributed in a 1:1 ratio between living epidermal cells and stratum corneum. The constitutive production of large amounts of IL-1α precursor by healthy epidermal keratinocytes interfere with the important role of IL-1α in immune responses, assuming skin as a barrier, which prevents the entry of pathogenic microorganisms into the body. The essential role of IL-1α in maintenance of skin barrier function, especially with increasing age, is an additional explanation of IL-1α constitutive production in epidermis. With the exception of skin keratinocytes, some epithelial cells and certain cells in central nervous system, the mRNA coding for IL-1α (and, thus, IL-1α itself) is not observed in health in most of cell types, tissues, and blood, in spite of wide physiological, metabolic, haematopoietic, and immunological IL-1α activities. A wide variety of other cells only upon stimulation can be induced to transcribe the IL-1α genes and produce the precursor form of IL-1α, Among them are fibroblasts, macrophages, granulocytes, eosinophils, mast cells and basophils, endothelial cells, platelets, monocytes and myeloid cell lines, blood T-lymphocytes and B-lymphocytes, astrocytes, kidney mesangial cells, Langerhans cells, dermal dendritic cells, natural killer cells, large granular lymphocytes, microglia, blood neutrophils, lymph node cells, maternal placental cells and several other cell types. These data suggest that IL-1α is as an epidermal cytokine. IL1A has been shown to interact with HAX1, and NDN. Although there are many interactions of IL-1α with other cytokines, the most consistent and most clinically relevant is its synergism with TNF. IL-1α and TNF are both acute-phase cytokines that act to promote fever and inflammation. There are, in fact, few examples in which the synergism between IL-1α and TNFα has not been demonstrated. These include radioprotection, the Shwartzman reaction, PGE2 synthesis, sickness behavior, nitric oxide production, nerve growth factor synthesis, insulin resistance, loss of mean body mass, and IL-8 and chemokine synthesis. The most important regulatory molecule for IL-1α activity is IL-1Ra, which is usually produced in a 10- to 100-fold molar excess. In addition, the soluble form of the IL-1R type I has a high affinity for IL-1α and is produced in a 5-10 molar excess. IL-10 also inhibits IL-1α synthesis. induces TNFα release by endothelial cells and Ca2+ release from osteoclasts. Topically administered IL-1α also stimulates expression of FGF and EGF, and subsequent fibroblasts and keratinocytes proliferation. This, plus the presence of large depot of IL-1α precursor in keratinocytes, suggests that locally released IL-1α may play an important role and accelerate wound healing. IL-1α is known to protect against lethal doses of γ-irradiation in mice, possibly as a result of hemopoietin-1 activity. Clinical trials on IL-1α have been carried out that are specifically designed to mimic the protective studies in animals. IL-1α has been administered to patients during receiving autologous bone marrow transplantation. The treatment with 50 ng/kg IL-1α from day zero of autologous bone marrow or stem cells transfer resulted in an earlier recovery of thrombocytopenia compared with historical controls. IL-1α is currently being evaluated in clinical trials as a potential therapeutic in oncology indications. An anti-IL-1α therapeutic antibody, MABp1, is being tested in clinical trials for anti-neoplastic activity in solid tumors. Blocking the activity of IL-1α has the potential to treat skin diseases such as acne. ↑ Nicklin MJ, Weith A, Duff GW (Jan 1994). "A physical map of the region encompassing the human interleukin-1 alpha, interleukin-1 beta, and interleukin-1 receptor antagonist genes". Genomics. 19 (2): 382–4. doi:10.1006/geno.1994.1076. PMID 8188271. 1 2 March CJ, Mosley B, Larsen A, Cerretti DP, Braedt G, Price V, Gillis S, Henney CS, Kronheim SR, Grabstein K (Aug 1985). "Cloning, sequence and expression of two distinct human interleukin-1 complementary DNAs". Nature. 315 (6021): 641–7. doi:10.1038/315641a0. PMID 2989698. ↑ Bankers-Fulbright JL, Kalli KR, McKean DJ (1996). "Interleukin-1 signal transduction". Life Sciences. 59 (2): 61–83. doi:10.1016/0024-3205(96)00135-X. PMID 8699924. ↑ Dinarello CA (Jun 1997). "Induction of interleukin-1 and interleukin-1 receptor antagonist". Seminars in Oncology. 24 (3 Suppl 9): S9–81–S9–93. PMID 9208877. ↑ Gery I, Gershon RK, Waksman BH (Jul 1972). "Potentiation of the T-lymphocyte response to mitogens. I. The responding cell". The Journal of Experimental Medicine. 136 (1): 128–42. doi:10.1084/jem.136.1.128. PMC 2139184 . PMID 5033417. ↑ Gery I, Waksman BH (Jul 1972). "Potentiation of the T-lymphocyte response to mitogens. II. The cellular source of potentiating mediator(s)". The Journal of Experimental Medicine. 136 (1): 143–55. doi:10.1084/jem.136.1.143. PMC 2139186 . PMID 5033418. ↑ Gery I, Handschumacher RE (Mar 1974). "Potentiation of the T lymphocyte response to mitogens. III. Properties of the mediator(s) from adherent cells". Cellular Immunology. 11 (1-3): 162–9. doi:10.1016/0008-8749(74)90016-1. PMID 4549027. ↑ Watanabe N, Kobayashi Y (Nov 1994). "Selective release of a processed form of interleukin 1 alpha". Cytokine. 6 (6): 597–601. doi:10.1016/1043-4666(94)90046-9. PMID 7893968. 1 2 Hauser C, Saurat JH, Schmitt A, Jaunin F, Dayer JM (May 1986). "Interleukin 1 is present in normal human epidermis". Journal of Immunology. 136 (9): 3317–23. PMID 3007615. ↑ Gahring LC, Buckley A, Daynes RA (Oct 1985). "Presence of epidermal-derived thymocyte activating factor/interleukin 1 in normal human stratum corneum". The Journal of Clinical Investigation. 76 (4): 1585–91. doi:10.1172/JCI112141. PMC 424137 . PMID 2997285. ↑ Schmitt A, Hauser C, Jaunin F, Dayer JM, Saurat JH (1986). "Normal epidermis contains high amounts of natural tissue IL 1 biochemical analysis by HPLC identifies a MW approximately 17 Kd form with a P1 5.7 and a MW approximately 30 Kd form". Lymphokine Research. 5 (2): 105–18. PMID 3486328. ↑ Barland CO, Zettersten E, Brown BS, Ye J, Elias PM, Ghadially R (Feb 2004). "Imiquimod-induced interleukin-1 alpha stimulation improves barrier homeostasis in aged murine epidermis" (PDF). The Journal of Investigative Dermatology. 122 (2): 330–6. doi:10.1046/j.0022-202X.2004.22203.x. PMID 15009713. ↑ Feldmann M, Saklatvala J (2001). "Proinflammatory cytokines". In Durum SK, Oppenheim JJ, Feldmann M. Cytokine reference: a compendium of cytokines and other mediators of host defense. Boston: Academic Press. pp. 291–306. ISBN 0-12-252673-2. ↑ Yin H, Morioka H, Towle CA, Vidal M, Watanabe T, Weissbach L (Aug 2001). "Evidence that HAX-1 is an interleukin-1 alpha N-terminal binding protein". Cytokine. 15 (3): 122–37. doi:10.1006/cyto.2001.0891. PMID 11554782. ↑ Hu B, Wang S, Zhang Y, Feghali CA, Dingman JR, Wright TM (Aug 2003). "A nuclear target for interleukin-1alpha: interaction with the growth suppressor necdin modulates proliferation and collagen expression". Proceedings of the National Academy of Sciences of the United States of America. 100 (17): 10008–13. doi:10.1073/pnas.1737765100. PMC 187743 . PMID 12913118. 1 2 Dinarello CA (2001). "IL-1α". In Durum SK, Oppenheim JJ, Feldmann M. Cytokine reference: a compendium of cytokines and other mediators of host defense. Boston: Academic Press. pp. 307–318. ISBN 0-12-252673-2. ↑ Arend WP, Malyak M, Guthridge CJ, Gabay C (1998). "Interleukin-1 receptor antagonist: role in biology". Annual Review of Immunology. 16: 27–55. doi:10.1146/annurev.immunol.16.1.27. PMID 9597123. ↑ Moore KW, O'Garra A, de Waal Malefyt R, Vieira P, Mosmann TR (1993). "Interleukin-10". Annual Review of Immunology. 11: 165–90. doi:10.1146/annurev.iy.11.040193.001121. PMID 8386517. ↑ Neta R, Douches S, Oppenheim JJ (Apr 1986). "Interleukin 1 is a radioprotector". Journal of Immunology. 136 (7): 2483–5. PMID 3512714. ↑ Dorie MJ, Allison AC, Zaghloul MS, Kallman RF (May 1989). "Interleukin 1 protects against the lethal effects of irradiation of mice but has no effect on tumors in the same animals". Proceedings of the Society for Experimental Biology and Medicine. Society for Experimental Biology and Medicine. 191 (1): 23–9. doi:10.3181/00379727-191-42884. PMID 2654945. ↑ Constine LS, Harwell S, Keng P, Lee F, Rubin P, Siemann D (Mar 1991). "Interleukin 1 alpha stimulates hemopoiesis but not tumor cell proliferation and protects mice from lethal total body irradiation". International Journal of Radiation Oncology, Biology, Physics. 20 (3): 447–56. doi:10.1016/0360-3016(91)90056-A. PMID 1995530. ↑ Smith JW, Longo DL, Alvord WG, Janik JE, Sharfman WH, Gause BL, Curti BD, Creekmore SP, Holmlund JT, Fenton RG (Mar 1993). "The effects of treatment with interleukin-1 alpha on platelet recovery after high-dose carboplatin". The New England Journal of Medicine. 328 (11): 756–61. doi:10.1056/NEJM199303183281103. PMID 8437596. ↑ Reichert JM (2015). "Antibodies to watch in 2015". mAbs. 7 (1): 1–8. doi:10.4161/19420862.2015.988944. PMID 25484055. ↑ Valente Duarte de Sousa IC (Oct 2014). "Novel pharmacological approaches for the treatment of acne vulgaris". Expert Opinion on Investigational Drugs. 23 (10): 1389–410. doi:10.1517/13543784.2014.923401. PMID 24890096. Verweij CL, Bayley JP, Bakker A, Kaijzel EL (2002). "Allele specific regulation of cytokine genes: monoallelic expression of the IL-1A gene". Advances in Experimental Medicine and Biology. Advances in Experimental Medicine and Biology. 495: 129–39. doi:10.1007/978-1-4615-0685-0_17. ISBN 978-0-306-46656-4. PMID 11774556. Griffin WS, Mrak RE (Aug 2002). "Interleukin-1 in the genesis and progression of and risk for development of neuronal degeneration in Alzheimer's disease". Journal of Leukocyte Biology. 72 (2): 233–8. PMID 12149413. Arend WP (2003). "The balance between IL-1 and IL-1Ra in disease". Cytokine & Growth Factor Reviews. 13 (4-5): 323–40. doi:10.1016/S1359-6101(02)00020-5. PMID 12220547. Copeland KF (Dec 2005). "Modulation of HIV-1 transcription by cytokines and chemokines". Mini Reviews in Medicinal Chemistry. 5 (12): 1093–101. doi:10.2174/138955705774933383. PMID 16375755. Schmidt DR, Kao WJ (Jan 2007). "The interrelated role of fibronectin and interleukin-1 in biomaterial-modulated macrophage function". Biomaterials. 28 (3): 371–82. doi:10.1016/j.biomaterials.2006.08.041. PMID 16978691. Huynh-Ba G, Lang NP, Tonetti MS, Salvi GE (Apr 2007). "The association of the composite IL-1 genotype with periodontitis progression and/or treatment outcomes: a systematic review". Journal of Clinical Periodontology. 34 (4): 305–17. doi:10.1111/j.1600-051X.2007.01055.x. PMID 17378887.